San Francisco Bay area author and forager Kevin Feinstein was taught to be afraid of mushrooms as he grew up. He was no different than many other children in this respect; after all a parents’ duty is to protect their children. After learning the hard way, Kevin conquered his mycophobia and moved forward to discover not only what mushrooms are edible but to teach others this valuable knowledge. 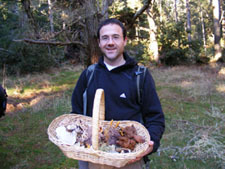 Crash Course in Wild Mushroom Foraging is Kevin’s recent work that is brilliantly targeted for the individual who want to learn about foraging for mushrooms. This e-book provides the reader with a solid introduction that every novice mushroom forager needs. As with foraging for plants, you can’t just go out there and do it; there is must-read information (or taught) before going out there haphazardly. Unlike foraging for wild plants, the consequences of consuming an unknown mushroom can be fatal. As Kevin explains in his book, even if a person can positively identify a mushroom that is edible, yet they are not home free. There are still other items to keep in mind such as the location it was found in, allergies and above all else, never eat a raw mushroom. Crash Course in Wild Mushroom Foraging is written succinctly and uses language everyone can understand. In addition, the balance between text and the use of photographs makes this publication visually appealing therefore making this a pleasant learning opportunity. Kevin Feinstein lives, forages and teaches various wild food classes in the San Francisco Bay area. He co-authored The Bay Area Forager, a guide to the edible plants of this region. 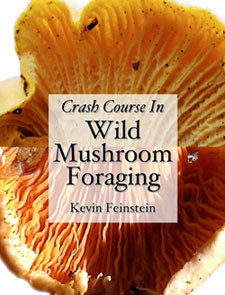 Purchase your copy of Crash Course in Wild Mushroom Foraging by clicking here on FeralKevin.com! Just want to add that some plants are deadly poisonous as well! What specifically do you disagree with? Kevin, or I can’t respond to a vague comment.